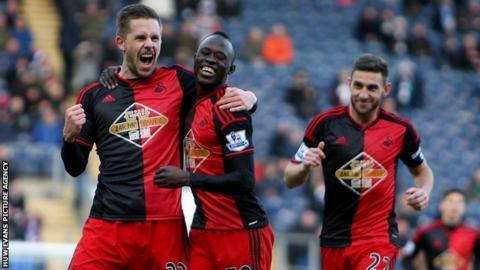 Swansea City are in their fourth season in the Premier League, and play Manchester United at home on Saturday. Swansea City have confirmed that plans for a deal with US billionaire John Moores to buy a 30% stake in the club are not expected to go ahead. The club had been in talks since the autumn with the former owner of the San Diego baseball franchise to invest in the club. But on Friday evening a club spokesman said a deal was "extremely unlikely". "Both parties felt that the time was not right to pursue any proposals," he said. "It was only at the discussion stage anyway, there was never any offer on the table." There has been no overseas investment in Swansea since the club was bought from Australian Tony Petty in 2002 when the Swans were struggling near the bottom of the Football League. The supporters' trust - who own 21% of the club - has in the past voiced its concerns about foreign ownership and club chairman Huw Jenkins said in November that any investment would need the approval of supporters. The club spokesman added: "We were never really searching for investment, there's no desperate search to find investments. The club is financially sound, there is no debt. "We are looking at ways to develop the club and help with the possible purchase of the stadium. "We are having discussions with the council at the moment about that, but again it is only at the discussion stage." Swansea play Manchester United at the Liberty Stadium on Saturday.